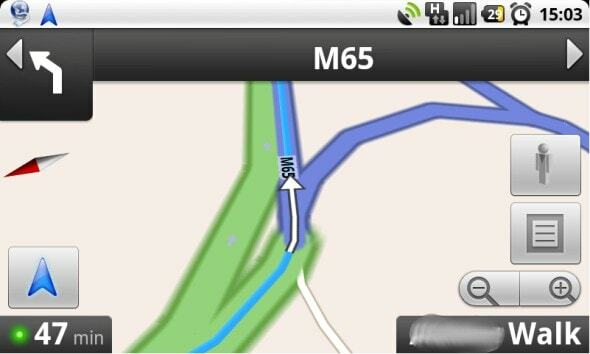 Home » Review » Google Maps Navigation Review (UK) – A Free Mobile Phone Sat Nav! Last week, Google rolled out turn-by-turn navigation for the first time in the UK, rivaling the paid-for alternatives that are currently available on the Market, and dedicated satellite navigation systems made by companies such as TomTom and Garmin. The update was rolled out to users of Android 1.6 and above (sorry HTC Hero owners) without any updates being pushed to phones, so many users that I speak to are still unaware that they actually have the feature available to them. Having the choice of satellite navigation available to me on my Google Nexus One handset is a great addition to the Android mobile phone platform. To access the new navigation features for Maps couldn’t be simpler. The interface is the same as always, with no change to the interface whatsoever. When searching for directions however, you now have the additional option of ‘Navigation’. Simply tapping on this option will open the navigation application and present you with your very own turn by turn satellite navigation system. 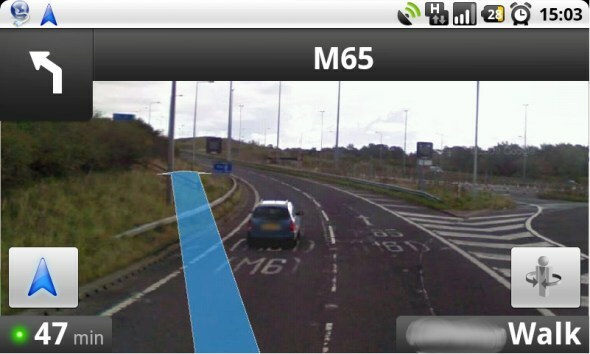 Users with a Nexus One can also access Navigation through their ‘Car Home’ application which was created to be used with the Nexus One car dock. If you’re running Navigation for the first time on your phone, you’ll be prompted to install a text-to-speech add-on from the Market to enable voice guidance on your navigation. After it’s been launched for the first time, it installs itself to the SD card before deleting itself from your applications menu and leaves you with a fully capable turn by turn navigation system. So what makes Google’s Maps Navigation stand out from the rest of the crowd? When I was using it, I found the integration with key features of Maps to be essential, and really enriches the whole experience. When navigating to your destination, you can utilise various features of maps and manage layers when navigating. As Maps is always connected to the internet through your phone, you receive traffic information for your route, with roads with heavy traffic indicated in red, moderate traffic in orange and clear roads in green. Also, when you’re given your estimated time of arrival for your destination, Google Maps Navigation accounts for the traffic and gives you two estimates, one with and one without traffic taken in to account. Your route is overlaid on the map in a blue line, which is easy to see in most cases, but if you’re on a motorway it may be difficult to tell the two apart from each other without looking more carefully. This is one of the few issues I found when using Maps Navigation, but it’s one that should be addressed nonetheless. A particularly brilliant feature of Navigation is the availability of Google Street View across most of the UK roads, which truly is invaluable if you’re unfamiliar with the area around you. You can choose to turn it on at any time, but it activates automatically when you’re arriving at your destination, making it really clear where to go by directing you to the right street and the right house with a big arrow. Overall, I found Maps Navigation to be not only easy to use, but also rich in features and integration with other Google services such as Maps overlays and street view support, which is definitely the killer feature here. If I was given a choice between Google’s own, free Navigation service and many of the paid satellite navigation alternatives on the Market, I would most probably choose Maps Navigation, proving how good the system really is, especially for the casual/mainstream users, obviously if you drive for a living it’s probably worth buying a dedicated system. I’d say that because Google Maps Navigation only downloads the map information needed for your route, whereas dedicated sat nav systems will store all the map information on the device, so if you need to deviate from your route, Google Maps will need an internet connection to update. Therefore if you happen to have no mobile signal at the time, you could be out of luck and have to go back to navigating the old-fashioned way with an road atlas! However, this will become less of an issue as the mobile network infrastructure improves across the country and using this system will always mean you have the latest up-to-date map information, so you won’t need to pay for map updates and won’t have to continually update your device. If you’re one of the many people out there who haven’t bought a sat nav system by now, then you should definitely try it out Google Maps Navigation. It’s currently available on all Android 1.6 (and above) mobile phone handsets and is free of charge – a sat nav bargain in your pocket!